Myslikova 20, 11000 Prague, Czech Republic. Hotel Manes is a very stylish and elegant hotel in the very centre of Prague, near the National Theatre and famous Laterna Magica, close to embankment of the River Vltava attracts the guests for the romantic walks with fascinating view of the Prague Castle and the Charles Bridge. Spacious and comfortable rooms are fully air-conditioned and equipped with the sound-proof windows assuring a pleasant and undisturbed stay. Don't hesitate to visit newly opened Sushi restaurant at Hotel Manes. Paid public parking near the hotel (covered) (18.00 km). Near trainstation, Centre, Museum Area, Near the historic centre, Near subway / tramstation. 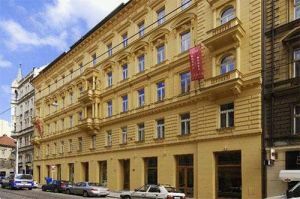 Hotel Archibald City is situated in a short distance from Wenceslas Square, in the very centre of Prague.